"A story to make you believe in the soul-sustaining power of fiction." "Los Angeles Times Book Review "
After the sinking of a cargo ship, a solitary lifeboat remains bobbing on the wild blue Pacific. The only survivors from the wreck are a sixteen-year-old boy named Pi, a hyena, a wounded zebra, an orangutan and a 450-pound royal bengal tiger. The scene is set for one of the most extraordinary and beloved works of fiction in recent years. Universally acclaimed upon publication, "Life of Pi" is a modern classic. Yann Martel was born in Spain in 1963 of Canadian parents. 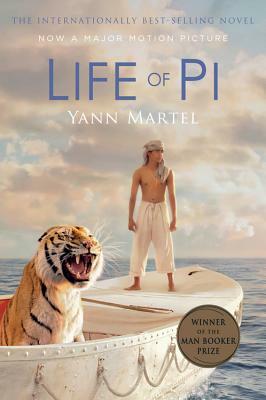 "Life of Pi" won the 2002 Man Booker Prize and has been translated into more than forty languages. A #1 "New York Times" bestseller, it spent eighty-seven weeks on the list and was adapted to the screen by Ang Lee. He is also the author of the novels "Beatrice and Virgil" and "Self," the collection of stories "The Facts Behind the Helsinki Roccamatios," and a collection of letters to the prime minister of Canada, "101 Letters to a Prime Minister." He lives in Saskatchewan, Canada. PRAISE FOR LIFE OF PI: "Life of Pi could renew your faith in the ability of novelists to invest even the most outrageous scenario with plausible life." "A story to make you believe in the soul-sustaining power of fiction." "A gripping adventure story . . . Laced with wit, spiced with terror, it's a book by an extraordinary talent." "A terrific book . . . Fresh, original, smart, devious, and crammed with absorbing lore." "An impassioned defense of zoos, a death-defying trans-Pacific sea adventure a la Kon-Tiki, and a hilarious shaggy-dog story . . . This audacious novel manages to be all of these." "Readers familiar with Margaret Atwood, Mavis Gallant, Alice Munro, Michael Ondaatje and Carol Shields should learn to make room on the map of contemporary Canadian fiction for the formidable Yann Martel."